In every direction, be it desert, mountain or gorge, aspiring Trewbadours can relish in Mother Nature & all the adrenalin and serenity it has to offer. This backdrop is important to note, for it proves that Trew clothing specialists are outdoorsmen themselves. Not content to blandly re-create the products of established companies, Trew clothing constantly challenges the elements with new and innovative products. They know that if their products work for them, they will most definitely work for you..
Far from one-trick adventure ponies, Trew clothing offers both men’s and women outdoor gear as well as helpful accessories. The ultimate combination of both form and function, you won’t have to sacrifice style of coziness just to stay warm on the slopes. 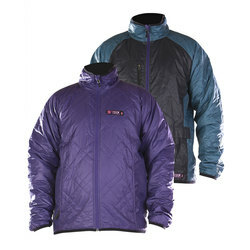 Take the Trew Polar Shift Jacket for example. Stylishly assembled to resemble a retro Oxford jacket, it also boasts groundbreaking material. Endowed with an Ultralight 15-denier double-ripstop nylon shell, this jacket bullies old man winter off his high horse. Additionally, it’s got a detachable insulated outer and hood, allowing you to customize your clothing when you’re already halfway up the mountain. From Trew Gear Chariot Bibs to Trew Gear Trewth Bib Pants, the folks at Trew have your back. Tough enough to protect a Deep Sea Fisherman but refined enough to emit a subtle stylish glow, Trew clothing commits to both aesthetics and performance. Speaking of aesthetics, Trew offers a plethora of tees, hoodies and beanies, all equipped with the Trew logo and a touch of personal flair to boot. Whether you’re in the market for some heavy-duty climbing protection or just in the mood to upgrade your lounging wardrobe, Trew clothing can satisfy your needs. Finally, what trewly sets Trew Clothing apart from its competition is their commitment to customer service. Confident of the efficacy and durability of all their products, Trew clothing offers a lifetime warranty on all their products. No extra fees. No catches. If their products don’t perform to their maximum potential, Trew clothing offers a full refund. This impressive warranty paired with their personal penchant for all things of adventure makes Trew clothing a company to trust for years to come.